In Barbara, Christian Petzold crafts a film of gripping yet subdued tension. It wouldn’t be considered a “thriller” in the American box office (or budgetary) sense, but it should be considered one. It’s shot plainly, deliberately, authentically. There are no secrets, you are the viewer witnessing the moral dilemmas presented solely as situations. And that is what so great. The title refers to Barbara Wolff (Nina Hoss), a doctor in 1980 East Germany that is punished by the government for attempting to leave the country and is subsequently transferred from Berlin to a hospital in a remote small town. She doesn’t know anyone. At first, she doesn’t want to know anyone. Her small apartment is sometimes searched by the officers assigned to keep an eye on her, and she’s particularly reserved and quiet. She quickly catches the eye of André (Ronald Zehrfeld) a colleague who later on says he’s there also as a punishment (medical malpractice, which sounds like it was technically someone else’s fault). There’s a patient that captures Barbara’s attention – Stella (Jasna Fritzi Bauer), maybe late teens or early twenties, a laborer brought to the hospital by the police after being caught hiding for days in tic infested fields, and also pregnant. 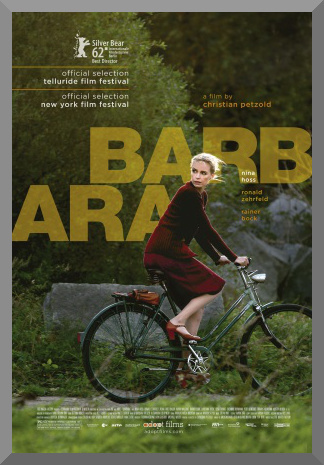 Barbara’s desperate attempts to keep ties (for multiple reasons) with the members of her previous life and escaping are depicted throughout the 105 minute movie, highlighted and expressed through an understated and powerful performance from Nina Hoss, a frequent star of Petzold’s films. She incontestably understands the flow of the story and the objective, and tailors the character of Barbara to suit each movement of the story. I already made a passing reference at the most striking thing I found about Barbara – the non-striking visual style. It is a stationary camera. Petzold and DP Hans Fromm realize the aesthetic requirements of this intimate character study, and respond with no special shots, a heavy emphasis on natural lighting, set designs without vivid or abnormal colors, and an intentional absence of notable incidental music, if there even was any at all to be recalled. It’s sort of a closed-off trend that one notices from European dramas, replete and recurring because it’s a style of filmmaking that commands great success when done right. Barbara is a low key film with much grander assumptions and implications. A fascinating portrait of the politics and their victims on the Comecon side of the Iron Curtain, it is meticulously but not obviously put together, and that is a sign of expert work. It’s greatly recommendable, for the intelligence and care on display to tell a riveting and compelling story about what would be an otherwise uninteresting main character. Under the hands of a competent cast and crew, just about anything can be made into a good movie, and that includes the story of a doctor working in a small town under an oppressive government that no longer exists.